Think “salad” and I bet your immediate thought is lettuce, tomato, cucumber maybe some onion and pepper?? Well this does not have to be the case! Keep things interesting by varying your salads, and chances are you won’t get bored of them and will continue to enjoy them. Summer is THE time for salads for many people. I think there’s something more satisfying about cold, fresh, crunchy vegetables on a hot day than having cooked vegetables. That said, I’ve always preferred raw vegetables, ask my nan, I used to live on raw carrots as a 2 year old! Anyway…I guess in summer having raw veg in salads saves us having a hot kitchen! My SO introduced me to this salad, and it was one he discovered after a family friend made it for a BBQ. He was always going on about it, and, as I have a preference for raw veg, it wasn’t long til it became one of my favourites too. I’m not sure on the original recipe, but this is how we prepare it. 1. Break the broccoli into small florets….and I mean small, like the size of your fingernail. Place this in a bowl to one side. 2. Chop the onion, also into small pieces, and add this into the bowl with the broccoli. 3. Fry the small pieces of bacon (or you can grill the whole pieces and cut them up afterwards). 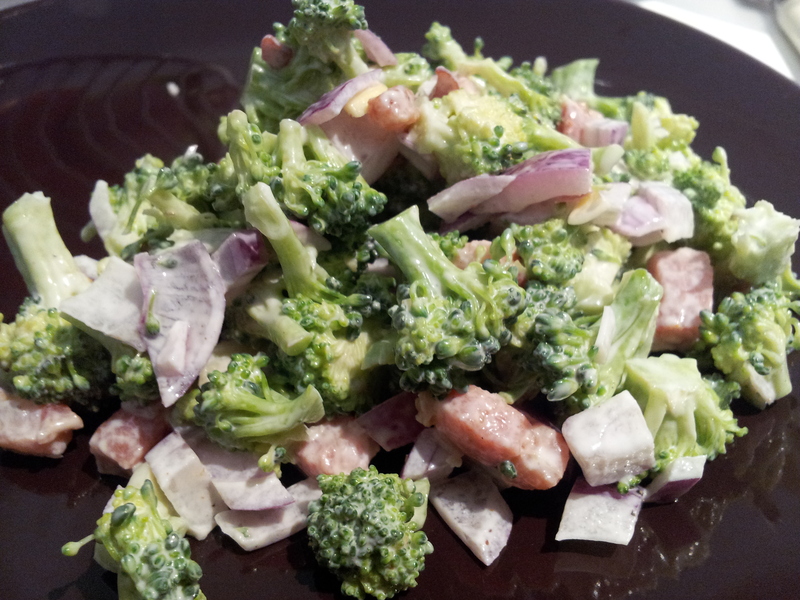 If you’ve fried, drain and pat the fat off before adding it to the bowl with the broccoli. 4. Scoop in the mayo with 1 tablespoon of yoghurt and 1 tablespoon of creme fraiche. Stir this in and see how it looks, it you feel it needs more “sauce”, add more creme fraiche or yoghurt. 5. Season with salt and pepper, and you’re ready to go! ← Is planning the key to eating healthily?